One of the coolest birthday parties out there is a Becoming a Magician theme. If your child loves magic, then this is a great party idea. Here you’ll find ideas for invitations, decor, food, desserts (my personal favorite part of a party! ), activities and loot bags. The first (and really cute) birthday party invitations come in a unique squiggle shape, offer 11 lines of personalization and come with envelopes. The return address labels (sold separately) are a cute touch. 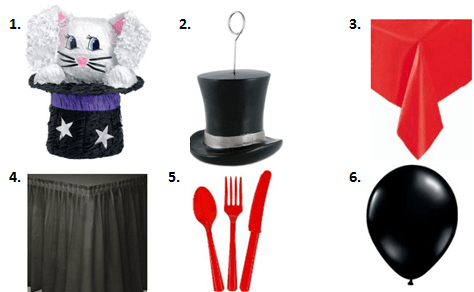 For those of you who are crafty, a fun idea would be to make a flat black paper magicians hat with a rabbit insert. The rabbit could be holding all of the party information. For a magician theme you’ll want to use a lot of reds and blacks. This can easily be incorporated through balloons, tablecloths and dinnerware. A cute idea for a centerpiece is to use a magician’s black top hat flipped upside down and fill it with flowers or a stuffed bunny or even a small dove (check your local craft store) sitting in the rim. For kids birthday parties, you always want to keep the food simple, easy to create and choose crowd favorites. Hot dogs, pizza or hamburgers are excellent choices. Create your own magic wand snacks buy using large pretzel sticks & dipping them in chocolate. For the magic wand white tip, you could dip the end in white sprinkles, coconut or white chocolate. Try making a regular rectangular cake and then once cooled, cut into smaller rectangles. Cover each with white icing and then use red or black icing (or gel) to create playing cards. Do you have a magician for hire in your city? The kids would enjoy watching some magic tricks and learning how to do some themselves. Want to learn magic tricks that you can do at home? Check out this site for some ideas! You could even break the group into a few smaller groups and assign each a trick. After a little practice, they could come together to do a magic show for each other. Buy a couple of Magic 8 Balls and have the kids take turns asking questions. 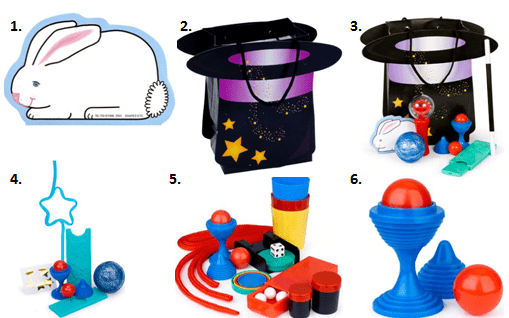 There are so many fun ideas for a special magician’s loot bag. Abracadabra! You’ve now created your Becoming a Magician Party! Happy Celebrating! Don’t forget to check out our Birthday Party Page for free party printables, planning tips and checklists, theme ideas and much more! Stay updated on the latest ideas by following us on Facebook, Twitter, Pinterest and Bloglovin’. Love the pretzel sticks dipped in chocolate idea – that works for fairy parties and princess parties too! Thanks for coming over on my SITS day . Nice to meet you! Hi: Just click on the picture of the product you like and it will take you to the suppliers page.